This prototype PDW, equipped with a S-E-F trigger group, and feeding from either 15-rounds or 32-rounds magazines, was designed as a full-auto counterpart of the O55C/SR1 "Gyurza" special pistol. 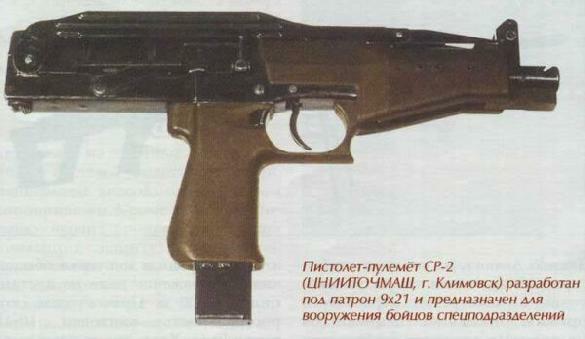 Such as the "Gyurza" pistol, the SR2-SMG was chambered to fire an armor-piercer variant of the .9x21mm-IMI ammunition appositely developed by the russians. Rumors say some of the "Gyurza" pistols to have been shipped to russian special forces, however, nothing is known about this PDW, which project looks like, in all intents, dead.